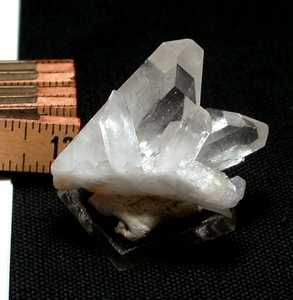 Tabular rock crystals, said to be great for communication, are the stars of this miniature sized Arkansas quartz cluster with one a large Isis faced crystal and one a twin. Not to be outdone, however, are a rare shield faced [six edges] crystal and one penetrated to have two faces! Light devic veils, a bit of iron oxide pointing to the regrowth of the milky base, and read-through clarity add to this cluster's strong appeal. 1-1/4x 1-5/8x 1-3/4" tall.